A cluster of deluxe individual timber bungalows and spa villas on the beach and immersed in sub tropical rainforest. This absolute beach front tropical location is just a short drive north of Sydney. Just over an hour drive from the Sydney Harbour Bridge. Whether it be a quick weekend escape or a romantic getaway, know that your stay will be an unforgettable one. 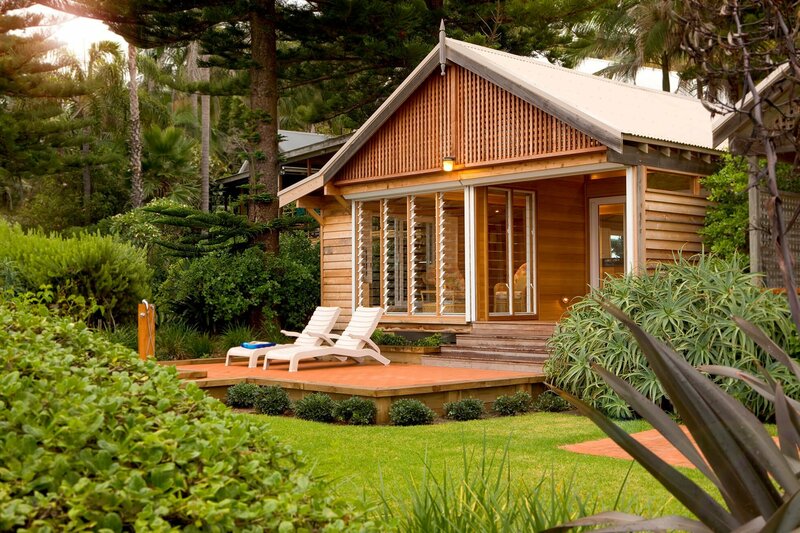 One of the most stunning Central Coast accommodations, Kims sits on the beachfront looking out onto scenic Toowoon Bay. 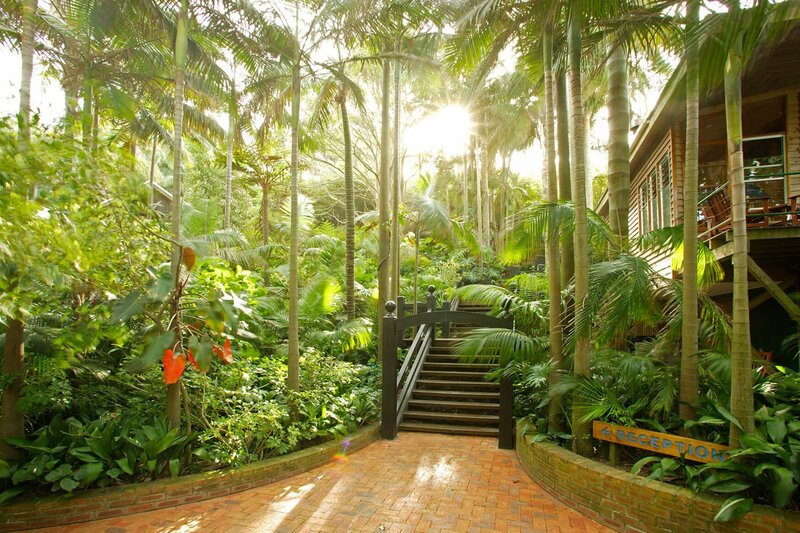 Only over an hour drive from Sydney, enjoy a luxury escape from the city hustle and bustle. Relax among nature, as we bring rainforest and sea together in one beautiful getaway. We make sure your stay with us is unforgettable. Kims is also the ideal romantic getaway. Enjoy the breathtaking views and indulge yourself in couple massages and facials and returning back to your own private villa and balcony. Some of our unique villas also include private spas and pools, so you and your partner enjoy the most intimate time away. Enjoy our other facilities such as air-conditioning in each room, Wi-Fi to stay connected, and a delicious restaurant for your meals. Not to mention our pampering services including massage treatments and facials. We make sure you leave our retreat relaxed and well rested. Your luxury getaway starts here at Kims Beachside Retreat. Home to 34 individual bungalows and villas, this Luxury Hotel will ensure you enjoy a relaxing escape coupled with the goodness and comforts of home. Toowoon Bay is situated on the New South Wales Central Coast, just over an hours’ drive north of the Sydney Opera House and a one hours’ drive south of Newcastle. Special promotions and current rates. "From the first day you arrive you feel the stress just melt away"
"There are too many good things I can say about the meals..."
"Our weekend at Kims was an experience that has etched the fondest of memories in our lives"
"Words are difficult to write to express how beautiful a time these 24hrs have been for us as a couple"
Nestled within a bamboo rainforest, Kims is the perfect luxury escape in the Central Coast. Whether it be a romantic getaway or a quick weekend retreat, our stunning accommodation is the ideal destination. We make sure your luxury escape with us is pleasant, enjoyable and most of all relaxing. Our popular beachfront villas, which are wrapped within the bamboo rainforest creates a magical spot where we link sea to forest. Enjoy a spectacular view of Toowoon Bay right from your own private villa. Each of our 34 suites and villas include air-conditioning in each room and Wi-Fi to stay connected. Kims also have a delicious restaurant for your meals, a cocktail bar to enjoy a drink by the sea, and not to mention our pampering services including massage treatments and facials. A prime location of only over an hour drive from Sydney NSW, Kims is one of the most popular luxury accommodations in the Central Coast. This retreat is an incredible escape from the city rush, as our team is dedicated in providing our guests an unforgettable experience at Kims Beachside Retreat.